The meadow buttercup is a pretty plant that can grows to a height of two feet or more.. Its dark green leaves are palmate, divided into 3 to 5 lobes. 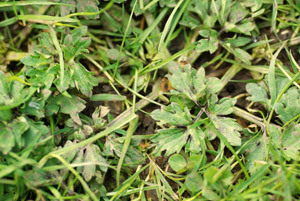 The creeping buttercup has 'tri-angular' leaves with 3 deeply cut lobes, the leaves of the bulbous buttercup also have 3 lobes but the end one has a clear stalk (and the base of the stem in the bulbous buttercup is quite swollen). As a broad generalisation, the meadow and bulbous buttercup are more likely to be found in grassland(s), whereas the creeping buttercup is to be found in damp places in woodlands, roadsides and gardens. Some buttercups come into flower in early Spring. 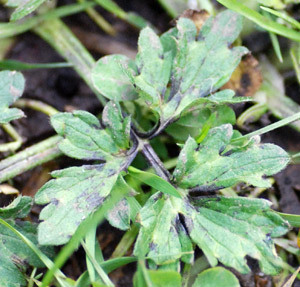 They may be found in fields, pastures, hedgerows meadows, and of course, lawns and gardens! 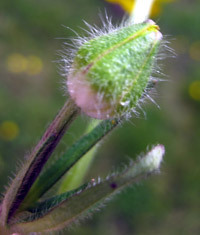 The early flowers are often those of the bulbous buttercup (Ranunculus bulbosus). Buttercups characteristically have 5 bright and shiny yellow petals, and five green sepals (sometimes turning yellow as the flower opens and matures) which surround the many stamens – also yellow. 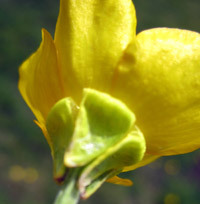 The reflective nature of the petals was described (in terms of the anatomy of the cell layers) by Parkin in the 1930's but recently it has been subject to more detailed spectroscopic analysis. The buttercup belongs to the Ranunculaceae. 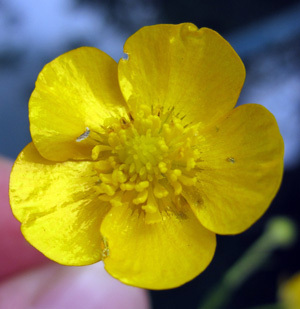 The flowers of the bulbous buttercup may be distinguished from those of the meadow buttercup (Ranunculus acris) by looking at the way the green /yellow sepals are arranged beneath the flower. 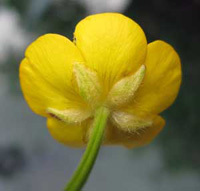 In the meadow buttercup, they lie ‘pressed’ against the flower, whereas those of the bulbous buttercup are said to be “reflexed” – the sepals hang down (see image). The creeping buttercup (Ranunculus repens) tends to prefer damp situations, but it is fairly 'easy going' and tolerant of soil conditions. It can spread rapidly by means of runners (or stolons). These spread out from the parent plant and produce roots at nodes along the runner. Where these roots take hold, a daughter plant may be formed. A daughter plant is genetically identical to the parent and to any other daughter plants formed from the same parent plant. 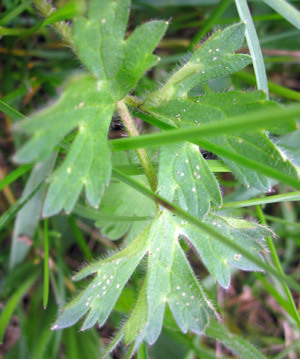 The creeping buttercup can therefore reproduce both sexually and asexually (or vegetatively). By reproducing asexually, it can establish clones – groups of plants with an identical genetic make-up. These clones may have particular and distinctive features, for example, six or more petals instead of the ‘normal’ five (as a result of mutations that have occurred in the parent plant). Such features will be perpetuated in the clones. 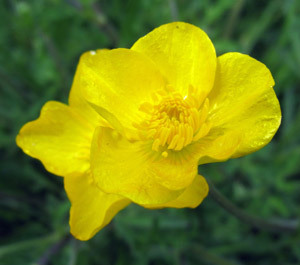 Buttercups, like many members of the Ranunculaceae, contain various toxic chemicals - which give them an acrid taste. These chemicals can cause skin irritation (on contact) and gastric / intestinal symptoms if ingested.